A look at some problems and limitations of quantitative easing. Readers Question: I was wondering if anyone could help me with how Quantitative easing can possibly reduce a budget deficit? and what are the downsides of quantitative easing? Encourage banks to lend. By increasing bank reserves, banks have in theory greater liquidity which encourages banks to lend to firms. To some extent, quantitative easing has limited the fall in output and rise in unemployment in the UK. Without quantitative easing, the recession would have been deeper. Nor as some critics feared has quantitative easing caused an increase in core inflation. When bond yields are already low (like US and UK) there is not much scope for reducing bond yields further. In a recession, lower bond yields are not sufficient to encourage investment trusts and banks to take risks with private sector investment. Most investors would prefer the security of a low yield bond than lend to firms. This is because prospects of a double-dip recession mean investment is risky. 30% of bondholders are foreign financial corporations. When Bank of England purchase bonds, they are buying bonds held by foreign investors. This will do little to stimulate economic activity in the UK. Quantitative Easing can’t replace fiscal policy. Despite the extent of quantitative easing in the UK, we will probably not avoid a double-dip recession in 2012. Arguably, quantitative easing needs to be combined with fiscal policy to maintain spending and investment in the economy. (or at least avoid the spending cuts of the past year) In other words, if the quantitative easing drives yields down to 2% and banks are not using the created money, there is a necessity for the government to be more pro-active in stimulating demand. Some suggest rather than buying bonds indiscriminately from banks, quantitative easing would be more effective if it was combined with a government bank who made targeted lending to small firms. This would be more effective in making the created money find its way into the economy. Inflation. 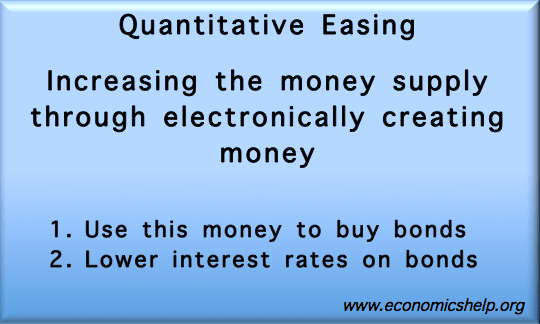 Quantitative easing has the potential to be inflationary because the created money could lead to a rise in the money supply which causes inflation. If the economy is in a liquidity trap, then the created money might not cause any significant inflationary pressure. But, when the economy recovers, the increased money supply may cause future inflationary pressure. However, many countries facing deflationary pressure may actually be helped by a policy of quantitative easing which helps overcome deflation. Also, it is debatable whether quantitative easing actually causes serious inflation. See – inflation and quantitative easing. In a liquidity trap, a higher inflation rate may actually help the economy recover. Depreciating Exchange Rate. Pursuing quantitative easing may cause the currency to fall over fears of future inflation. However, in a recession, a depreciating exchange rate can be helpful. Unwinding Positions. The Bank of England has bought £275 bn of assets. It is committed to reversing these purchases when the economy recovers. However, to find buyers for £275bn of assets may be difficult. Quantitative easing makes it easier to finance a budget deficit because the Central Bank is buying so many bonds, but when the period ends, it could become more difficult. Potential Bond Bubble. Investors may be bonds to take advantage of Central Bank’s intervention. But, this enthusiasm for bonds may evaporate when the policy ends and the Central Bank reverses its position. Inequitable Distribution. Arguably benefits of quantitative easing are mainly felt by high-income earners, bankers and bondholders. See: Who benefits from quantitative easing? How Quantitative easing can possibly reduce a budget deficit? If quantitative easing is successful, there will be higher bank lending, higher growth and lower unemployment. This will reduce a budget deficit. (government get higher tax receipts and lower spending on unemployment benefits. By creating inflation, it can reduce the real debt burden of a government. By buying bonds, quantitative easing makes it easier to finance a budget deficit, though it doesn’t actually reduce the amount available. ← Should low inflation be the primary objective of economic policy? You missed out the massive inflation in stock prices and house prices (caused by QE) in parallel with static incomes. This has created massive housing poverty and homelessness.